About 6 minutes and 11 seconds reading time for this 1.7K word page. It's really nothing new, investors are looking for a good investment. If you have a few thousand dollars and would like to become a disaster zone investor 2016 and 2017 should give you a great start in your new business. We know many investors in our area, some are knowledgable while others, well let's say a fool with their money is soon parted. Investing in disaster zones is a big risk, it's an area of unknown unless you study historical data from previous disasters. Most of the investors we have seen simply live in the moment or maybe in the clouds. When you lend money by security you need to know that the security has value. If I gave you my truck, valued at $100.00 for a Loan of $100.00 plus a fair market loan percentage you can rest easy beause that's a bad loan and worthless security. If you were to give me $10.00 on my $100.00 Truck at 10% componded daily with the truck as collateral that would be a better investment. If you are lending money and securing the loan with property you want to make sure the property can actually be used as it is intended. Example: Buying a flooded home on a 50x100 lot in Denham Springs LA. allows you to rebuild the home as it was on the lot. You may elevate the home but due to the size of the lot expansion would be limited. If you purchased a lot in a flood zone like Denham Springs LA, Zone X, AE, and the lot size is 50x100 the city planners office will not issue a building permit due to the minimum lot size impossed by the City Councel years ago. The lot needs to be at least 70x110 to build a R1 home. There were a few investors that parted from their money after the flood. Buying up 3 homes side by side thinking they could build new cottage style or NOLA style homes on them. Once they removed the home and the homes foundation (most here only blocks) they then applied for a building permit only to find that the codes for owning "Contiguous Lots" meant that they needed to rezone the lots from 50x110 to 70x110 and not leave any lot size smaller than what could be built on. These investors that purchase flooded homes with lots 50x110 soon found they actually owned one lot 150x110 which would allow them to build one home on the 150x110 lot or request a subdivide of 75x110 to allow for 2 buildable lots. So many mistakes are made when people are looking for quick profits. Some investors saw other investors listing land, flooded and gutted homes for $50,000.00 or more. We have Investor landowners asking $75,000.00 for 260x180 lots in an area filled with lots worth $8 to $9,000.00 each that can be rezoned without much difficulty according to those that have alread done so. The reality check is this, you're buying land in a older sub-division that has smaller lots than the newer sub-divisions. You then will wait to see if the city allows you to build on smaller lots. If the city goes backwards and allows you to build new homes on smaller lots many current landowners will do the same. Your new home market will then be flooded with low cost to own 1,100 sqft homes. Investing or lending on property the size of 30x150 as collaterial in most books is just bad investment practices. Unless you are looking for the long term investment or acqusition of the neigbhoring property investing in property that does not meet code requirements for building are bad investments. Let's take one of our neighbors actual investment loan from a Realtor that also does secured loans. Our homeowner knows how to budget money and has cash flow. So why would this same person sell part of the property that her current home sits on? Let's see if their is any logical process involved here. You had no homeowners insurance. You do not have cash capital to rebuild. You don't want to wait for federal or state grants and low interest loans or other funding. You do not qualify and your home does not qualify for a conventional mortgage. Walks in the Realtor Investor. They are willing to loan you the money to get you going. They suggest you offer up a small percentage of your property as colladeral living the main body of the property in the homeowners name. The end game may simply be a quick high interest loan. But the end game may be to acquire your property by giving you no choice but to deal with this investor realtor. 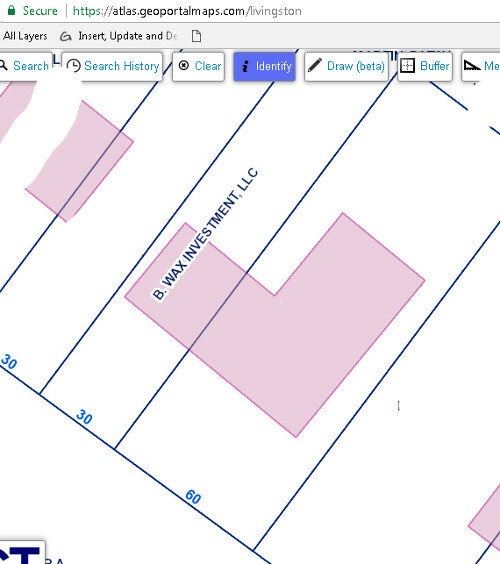 You sold to the B Wax Investment LLC a 30x150 lot that was part of your combined lots. The main homes structure was built on the lot you just sold. All power service enter and connect to this side of the house. Let's take the electrical service which is supplied by Entergy and connected to your main distribution panel that is installed on a bedroom wall. The land in which the connection is made is no longer the homeowners. In fact, 600sqft of the home is now on the property owned by the Realter Lender. Was this a good move on the Homeowner side? Was this a good move on the Investment side? At times like these I wish we all had "Risk Management" classes and were forced to work high risk loans for one year so we never have to look at them again. If the homeowner pays all the payments on time and eventually pays off the loan you would hope that the investor would return ownership to the homeowner. Is this all legal? If you look at city codes you might find a 30x150 lot isn't buildable so what type of investment would that be if the investor had to sell the lot the the old house still sits on? Is this to code to have a service drop to a house that doesn't match the 911 directory now that it's owned by a investment group? What could go wrong for the homeowner? First thought is the electrical drop could be ordered removed. The part of the home that overlaps the property line could be ordered removed and property setback enforced. The investor could offer a new loan with the total property with structures as colaterial which would actually make the homeowner a rent to own owner which takes a different curve to who is responsible for what. In a Rent to Own the person renting and thinking one day they will own the property can not make changes or improvements without the owners concent which would be the lender. You also are dependent on the owner to make repairs which they do not have to follow any item code or time period to do so. Basically you are hiring your own landlord. Hope you find a good one. The question is what to name this type of loan when property is sold as collateral and they payments are made to retrive the sold property. Let's compare it to a pawn, you might be a $100 item to a pawn shop and that pawn shop owner will ask, do you want to sell it or pawn it. Sales go for about 10% of the items value based on research done at the time on Ebay and other online reseller locations. To Sell an item is to basically give it away for one tenth of it's actual value. To pawn is different, you may still be working on the 10% range but often a pawn shop will offer more if they see an item that might net a higher return. They also look for items that can sell in under 30 days. When this homeowner signed over the land to the lender was this a Sale or a Pawn? It was a Sale, a Pawn would not have allowed the title or ownership to change unless the loan was defaulted on. In a sale the sale needs to be clean of any and all restrictions. In this case we have 600sqft of home on the sold property. Want can happen if the new owner attempts to sell the land to anyone other then the past owner? We have not seen this type of lending, it's actually a little desprete in design on both parties. Who wins in the end will take time to see, this will be like watching grass grow and without the actual paperwork it's all speculation. Since this is one of our neibhors and all the information collected is public via the Tax Assessors office we can only wait and see if the land sold is retitled in the old homeowners name or turns into something we've never seen before by Realtor Investors. A piece of property for sale that has a master bedroom and electrical hooked owned by the neighboring property owner. Doesn't sound like a good sale to me. Note: FEMA and LA Restore could have put in place options to prevent this type of investment issue and loan risk. But politicians are still dragging their feet. We don't want to say that they aren't doing their jobs. But, I will say anytime you would like to learn what's really going on we have neighbors waiting for answers and living in temporary shelters, rentals, trailers, or even the flooded and gutted home. Every day is a reminder of the loss of property and possessions. We all have our limits, we are standing ground and will wait for additional assistance, but others that can't wait are being tossed into the loins den of investment realtors. As always, we welcome any politician to live with us for one or more weeks. We want to share with you our day to day lives and how things have changed due to the flood disaster. We want to show you just how long it really takes to rebuild.